Where do I start?!?! This is one of the nicest farms I have ever seen. It is located in San Salvador, 15 min from the paved road in Tinamastes and halfway between Dominical and San Isidro. This 131 acre farm has it all. When you enter the farm there is a 4 bedroom modern home that the caretaker’s family lives in. Then further on in is the owner’s small home which consists of a loft bedroom and a kitchen, living room, porch, and carport. Further along in another similar home. There is also an old Tico home that can house more workers. There is a cattle barn w/ tack room, a pig barn, a horse corrall, and a sugar cane mill. The farm comes with 15 cattle, 2 oxen, 7 pigs, 5 beautiful horses, a greenhouse full of vegetables, a field of sugarcane, a huge pinapple patch, tilapia ponds, and countless fruit trees. Basically enough food and animals to be completely self contained. Not to mention the countless springs that run through the property. The owner has built 2 concrete swimming pools in the jungle that run fresh spring water through them. One of them is set up for hydro electric. He has the entire system in place including the pipes and turbine. Don’t forget the views! 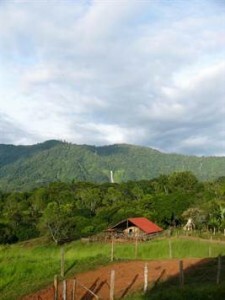 From almost everywhere on the farm you can see the famous Diamante Waterfall and some amazing mountain views. On one epic spot the owner has built a large rancho with kitchen. His idea was to have eco tours and stop there for lunch. There are countless spots to build throughout the entire farm. At the bottom of the farm is one of the most spectacular rivers you will ever see packed with waterfalls and swimming holes. The internal road does a loop through the entire farm and the trails down to the river are very easy to walk.